Starting his career as a successful illustrator in Chicago, Phil was drawn to the world of fine art in 1980 when he arrived in Scottsdale, Arizona. A colorist with a painterly style who stresses harmony in his artwork, Phil studied at the American Academy of Fine Art in Chicago. He is a versatile artist who specializes in figurative work. Phil's love for animals is apparent in his work, and animals appear in most of his painting as he brings them to life on canvas. Phil's predominant medium is oil, but he is also known for his speed and accuracy in his beautiful drawings. 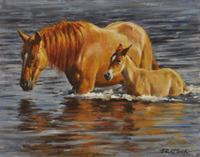 Phil was an instructor at the Scottsdale Artist School for over twenty two years, and has also taught workshops around the country, where his talents were sought after as an instructor and lecturer. His paintings have garnered numerous awards and hang in many private and corporate collections throughout the United States and abroad. Phil has been honored with the highest awards presented in several different museum shows, including Gold Medal in oil, Best in Show, Artist Choice Award, and the prestigious Goodman Award for best oil painting in the show. Cheyenne's Old West Museum honored Phil in 2008 with the Museum Purchase Award for his painting Cowboy School. The painting was also selected for the limited print for 2009. The Museum Purchase was again given to Phil in 2011 for his painting Standing Bovation. Phil was also honored to receive the People’s Choice Award at the Phippen Museum's Hold Your Horses Show for 2014 and 2015 exhibition. He has been featured in Southwest Art Magazine, Art of the West Magazine, Cowboy and Indians, Western Horseman and several other publications. Phil is a participant in several shows including, Mountain Oyster Club, Cheyenne Frontier Days Museum Show, and the Phippen Museum's Hold Your Horses Show and Miniature Masters show, to name a few. Phil lives with his artist wife, Marty, in Scottsdale, Arizona. His passion for painting is never ending, and it is truly that, a passion.